I am setting up my 3 stage fuel pump control on an RX7 with stages injection. The link help file says that I need to set the Inj Duty Cycle that I want to change from Low to Med then Med to High flow. How do I display this duty cycle so I can see it live and can see when the fuel pressure tapers off. 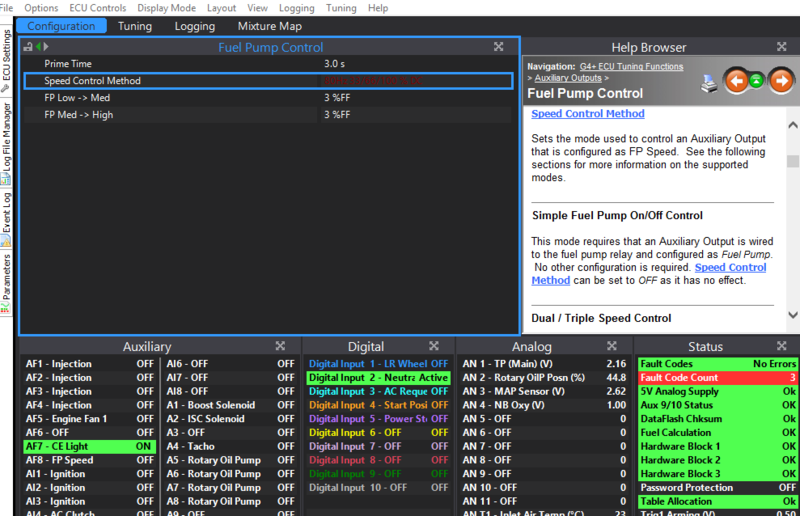 You can view it on the fuel tab of the runtimes screen (F12) or just like any other parameter you can add it to a gauge or time plot etc. Typically low speed is just to make it quieter at idle so set the low>med quite small, something like 5%. The Med>hi setting will depend how much headroom your system has but commonly this is around 10-15%. Can you think of any reason it would do this? I have had to set that output to fuel pump and run it normal triggering low side. I suspect that mode has been locked to "high polarity" as the Subaru and Supra that commonly use this control method both work this way. Set up as below will give you something similar. Thanks for this. Will this still work with a Hella SSR or will it require a Fuel pump speed controller? Yes I would expect most pumps to be happy with 1000Hz PWM (max rating for the hella relay). I suggest you use aux 1-4 rather than 5 in my example above. Aux 5-8 can only do 300Hz max. Thanks for the help Adam. I'm running a s6 RX7 plug so only have the option to use AUX inj 6 or 8 as they are the 2 currently available. Are there any issues in using 300hz? Are there any issues in using 300hz? I suspect it will still work ok, you are going to have to try it and see. It will probably make more noise than expected at low PW. I have heard of guy's doing it at 100Hz due to some of the cheap SSR's not working at higher frequencies so it should be ok.
Hi. Using INJ 8 I don't get the option of a frequency. Is this port not able to do PWM? and could this have been my issue all along? 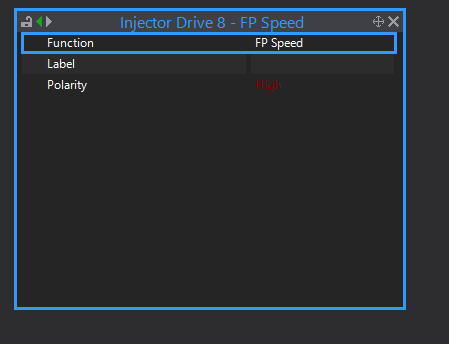 Currently it looks like you cant do PWM FP speed on an inj or ign output. How about aux 3 on pin 7? Otherwise you could move the tacho to INJ8 and use Aux 4 for the FP Speed.